Ibi Aziz (bass viol) Marais "D'un Goût Etranger"
This annual event has gradually altered over the years and has virtually become a showcase for Trinity College of Music's Early Music Department, with fewer outside visiting performers than we used to have (c.p. 2002). The "international" aspect is now mainly signified by the range of nationalities of its students. 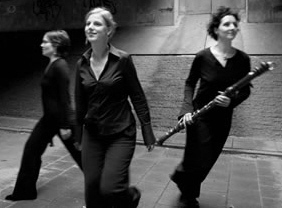 The recorder featured strongly, its players having also made an important bridge between old and new by presenting contemporary works at this festival (obligatory for the Moeck/SRP competition). Those have added welcome variety for non-specialist concert goers, and hopefully younger players of other early instruments will follow suit? The gratifying attendances for esoteric musical events (some of them oversubscribed) were swelled by visitors to the Early Music Shop's concurrent exhibition by international instrument makers and publishers. Ibi Aziz, in 2005 the first ever winner on a period instrument of Trinity's gold medal, launched the proceedings with an engrossing recital of Marais, whose 32 "couplets" for bass viol on the familiar Folies theme seemed to rival Corelli's in variety and interest. There was a good turn-out for a morning concert, and at the end I thought "it can't get any better". But it did! After lunch there was a full house for the TCM Early Music Ensemble of singers and instrumentalists for the biggest show of the weekend, a rare opportunity to hear five of Praetorius' unaccountably neglected and resplendent post-Monteverdian motets in up to 18 parts, one of them in two languages simultaneously. 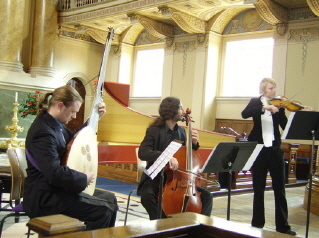 This great concert, under the inspiring direction of Philip Thorby, exploited the Chapel's ideal ambience and acoustics, with groups of musicians in the galleries as well as those on the floor (illustrated above). Amongst the smaller concerts in the Chapel, Melopoetica gave particular pleasure, with Siv Thomassen in a commanding account of a Biber sonata on her sweet-toned baroque violin. Thorby masterminded also the last of the big events, a tribute to the late Edgar Hunt (1909-2006), recorders pioneer in the early music revival and associated with Trinity from 1926. His life and influence were celebrated in a perfectly designed concert which allowed us to hear a wide sampling of Hunt's favourite music. Directing proceedings mainly at the recorder, Thorby led a group of students and Trinity teachers, the high points being a Purcell Chaconne, a unique Vivaldi trio for treble recorder, baroque oboe and baroque bassoon, and as good an account of Rubbra's exquisite Meditation which, in those old days when Hunt and Dolmetsch were active, I had enjoyed playing on recorder and piano (Hunt's preference for the accompaniment). To finish, a deeply moving presentation of J S Bach's funeral cantata BWV106, with one musician to a part and a chamber choir of eight singers from whom the (unnamed) soloists were drawn. The previous night had been a celebration for David Munrow, a continuing influence twenty years after his tragically premature death by suicide left a yawning vacuum in the early music world. But the movement grew and that concert allowed us to celebrate also another national treasure, counter tenor James Bowman for whom no allowances at all need to be made at 65, his voice and infinitely subtle musicality in fine fettle. Partnered by Nicholas Clapton, a leading countertenor of the next generation, we had Purcell duets, Blow's Ode on Purcell's death and a strikingly successful novelty, Judith Bingham's 'opera scene' on the death-bed conversion of the dissolute Earl of Rochester, a winning addition to a small repertoire. This concert was also notable for the participation of John Turner, who had been responsible for many 20th C recorder compositions. Most substantial was Martin Butler's Back to Ground, an elaborate trio for recorder, cello and harpsichord, which cannot reveal all its secrets at a single hearing and urgently deserves to be recorded. To finish, James Bowman held us spellbound with a group of solo Purcell favourites, ending with Evening Hymn to chamber organ accompaniment, before a reprise with Nicholas Clapton of Sound the Trumpet. The final concert of the Festival will have disappointed the reasonable expectations of those of us who were well pleased with María Martínez Ayerza's success in last year's prestigious Solo Recorder competition, at which she appeared unaccompanied, entirely on her own. For her Moeck/SRP Winner’s recital she opted instead to present in Greenwich the ÆroDynamic ensemble led by singer/dancer Harma Everts. Their mainly contemporary trio presentation was an inappropriate way to conclude an Early Music festival, even given that we had some Dunstable and Binchois' Adieu adieu to send us home. Rolf Riehm's bizarre Weeds in Ophelia’s hair (1991) might have passed muster in a BMIC "cutting edge" experimental concert; Elizabeth Westerhof-Gaskill's Gedichten voor Shiva (no words or translations supplied) was dominated by Harma Everts' ritual song and dance. Donatoni's virtuosic Nidi, to which we looked forward, was dropped without announcement, and Maria's only solo to survive was an overlong piece from Isang Yun’s ‘Chinese Pictures’. Smaller events were held in these attractive intimate venues in Trinity College's buildings. They have limited space, so that listeners sometimes had to be turned away. Colin Booth played music in the French style on a new copy he had made of a Vaudry hapsichord in the Victoria & Albert Museum. There can be few instrument makers who command such stylish virtuosity as performers (See his website for recommendable CDs). The clavichord featured more than previously, with a demonstration of a new, not quite finished, Edmund Handy instrument, and John Henry taught on both harpsichord and clavichord in his master class. His fascinating comments, often abstruse and esoteric, were hard for the audience to hear; a radio mic would help next year? Jennifer Snapes and colleagues gave me more pleasure in flexible, expressive Rameau and Bach than did Ensemble Telemania, the efficient Ella Kidney winners, in their more formulaic music by Keller & Telemann. At Blackheath a keen semi-improvising group supported former Moerck winner & PLG Young Musician Emma Murphy's recorders in her Divisions on a Ground recital of late 17C English music. She is a versatile recorder player and singer who has maintained her interest in contemporary music for her instruments. The invigorating programme delighted those who made it to the other side of the Heath, with the items worked up from rudimentary scores and embellished spontaneously as they went. A CD is promised from Signum next year. 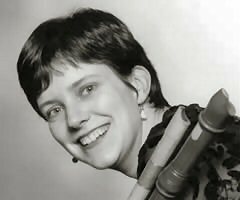 * Meanwhile, it was regrettable that her excellent Celtic Celebration CD, playing five different recorders with Steven Devine and Susanne Pell, could not be put on sale at Blackheath Halls after the performance - why not? It is beautifully programmed, perfectly recorded and most highly recommended. All young musicians have difficulties in making their ways and marketing recordings, so it is mutually beneficial for them, and for their audiences, to make CDs available for purchase at all concerts. The International Exhibition with instrument makers and publishers from many countries (promoted by the Early Music Shop) is so separate from the Festival (one cannot go down to the bar for refreshments during intervals or after the concerts) that it would be better to have the Exhibition Brochure (not too easily navigated nor free of mistakes, e.g. time of the Blackheath concert) separated from the concert programmes. Those need to be better designed, with the information one expects such as dates of compositions, texts of vocal items and fuller programme notes - and maybe with less of the available space filled with photos and over-inclusive performer CVs ?